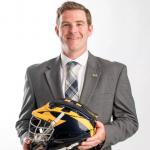 Kevin Conry was announced as the second head coach in the history of Michigan men’s lacrosse on June 21, 2017. I loved this podcast with this great coach, He arrived in Ann Arbor after spending the last five seasons at the University of Maryland as defensive coordinator, and the past two as associate head coach. Conry’s tenure got off to a hot start with 7-2 record in non-conference play, and Michigan had a program-best 5-2 home record on the campaign, winning the first five home contests of the season at the brand new U-M Lacrosse Stadium. The Wolverines set new high water marks for highest rankings in both national polls, checking in as high as No. 15 in the Maverik media poll and 17th in the USILA poll. Wins over ranked opponents on the road vs. No. 4 Notre Dame on March 21 and No. 14 Penn State in overtime finished out the season on a high note. In all, U-M ended the season with an 8-6 overall record. Conry, who was named head coach John Tillman’s top lieutenant prior to the 2016 campaign, was part of one of the most successful eras of Maryland men’s lacrosse, including the Terrapins’ 2017 national championship. In five seasons, he helped lead the Terps to four NCAA Final Fours and five Big Ten Conference titles. In 2017, Conry’s defensive unit earned a long list of accolades, including the Schmeisser Award, which was presented to Tim Muller for being the nation’s top defenseman. Isaiah Davis-Allen earned First Team USILA All-America honors for the second straight year, becoming the first Maryland defender to achieve the feat since 1975-76. The 2016 Maryland defense featured a bevy of experience developed under his guidance, including five USILA All-Americans. The Terrapins won a school-record 17 games en route to their third consecutive NCAA Final Four appearance. Conry’s defense ranked 10th nationally in scoring defense (8.35 goals/g) and third in man-down defense (73 percent). Conry’s defensive unit led the nation in scoring defense in 2015, allowing just 7.1 goals-per-game en route to Maryland’s second straight NCAA Final Four appearance. Kyle Bernlohr received the Kelly Award as the nation’s top goalkeeper, making the Terps the first team to win the award in back-to-back seasons with different goalkeepers since 1961-62 (Niko Amato, 2014). In 2014, Maryland ranked third in the nation, allowing just 7.24 goals-per-game as goalkeeper Niko Amato and defender Goran Murray captured USILA All-America first team honors. The stout defense helped the Terps advance to their third NCAA Final Four in four seasons, while Amato received the Kelly Award for the nation’s top goalkeeper. In his first season in College Park, Conry oversaw a defensive unit that ranked first in the ACC in points allowed and ninth nationally, while playing one of the toughest schedules in the country. Under his tutelage, five Terrapin defenders earned All-America honors in 2013, led by senior Jesse Bernhardt, who became the first Terp since 2006 to garner a first-team selection. Conry made the transition to College Park after a successful four-year stint at Fairfield University, where he was the Stags’ associate head coach for two seasons. He was responsible for turning around a defensive unit that ranked 39th in the nation prior to his arrival into a unit that ranked among the top 16 in the country in each of the past three seasons. In addition to the six-on-six defensive improvements, he also helped the Stags improve in man-down defense, with Fairfield ranking among the top 17 in the nation since 2010. He was also a big factor in Fairfield’s recruiting efforts, including the Stags’ 2013 freshman class, which was ranked the 12th-best incoming class in the country, according to Inside Lacrosse. Prior to joining the Fairfield coaching staff, he spent the 2007 season at Penn State University, where he helped recruit the 2008 Nittany Lions’ freshman class, which Inside Lacrosse ranked the fifth-best class in the nation. Penn State finished the 2007 season with the 13th-best defense in the country, allowing just 7.92 goals per game. He started his coaching career at Siena College, where he served as an assistant from 2004-06. A 2004 graduate of Johns Hopkins University, Conry was a four-year member of the Blue Jays’ lacrosse team, helping the squad to a runner-up finish in the 2003 NCAA Division I Championship. He earned a bachelor’s degree in political science at Johns Hopkins and went on to earn a Master’s of Science in Education from the University at Albany in 2006. A native of Rockville Centre, N.Y., he is married to the former Elizabeth Hannan. The couple has three daughters, Izzy (4), Lily (2), and newborn Charlie. I recommend you listen to the free Preview, I chose this portion of the full podcast as it is an incredible concept. Coach Mike, great interview. I use a hybrid selection process similar to the one you described above with a blind vote and then the coaches select the captains. We also leave one slot open during pre-season for someone to step up and show leadership and a desire to be a captain. We hold captains leadership meetings each week. Where we discuss various topics about what it takes to be a leader and to also get a view of the team from their eyes. But, I like Coach Conry’s vison of a leadership council involving players from different age groups. I think the perspective will be different from a freshman on the pace of practice as it will from a senior that has been at the same pace for 4 years. I also love the concept of ownership in the team. One thing I have noticed with this generation is that they have to know WHY they are doing something. No longer can I just walk through a defensive package or even a drill without blank stairs if they don’t understand why we do it this way. I use an EGG method to my coaching. I Explain it, Give a demo, Get a demo and then go live. It is often difficult to do this in a fast paced practice. Using my captains meetings to explain why we do it and then they are 1st up in the drill helps. I can only imagine how much better it will be with the whole counsel understanding. Great Comments, thanks Coach, the knowing “Why Factor” is huge w this generation, you have the reason, just share it!